For parts of a bicycle, see List of bicycle parts. A mountain bike with wheels that are approximately 27.5 inches (700 mm) in diameter and are based on ISO 584 mm (650B) rims. A mountain bike with wheels that are approximately 29 inches (740 mm) in diameter and are based on ISO 622 mm (700C) rims. a UCI rule stating the depth and breadth (in cross-section) of the bicycle frame tubes cannot exceed the ratio of 3:1.
giving it all a rider has, going all out, riding as hard as one possibly can, which can be risky for it leaves one in a state where recovery is needed, and therefore vulnerable to being attacked. Example: "I really gave it all in the last kilometers, although I didn't think it was possible until I crossed the line. I just went "à bloc". Extension of the handlebars usually allowing the rider to rest their elbows and benefit from improved aerodynamics. Often found on Time trial bicycles. A type of racing bike that combines the aerodynamic features of a time trial bicycle with a road racing bicycle. Off-road tire, or a bicycle tire designed to function well for varied terrain and uses. A racing cyclist who excels in both climbing and time trialing, and may also be a decent sprinter. In stage races, an all-rounder is likely to place well in the General classification. All-rounders are usually Team Leaders in both stage races and classics cycle races. The term all-rounder can also mean a bicycle designed to function well for varied terrain and uses. A bicycle race typically organized by bicycle messengers or couriers. Alleycat races seek to replicate some of the duties that a working messenger might encounter during a typical day. The races usually consist of previously undisclosed checkpoints, which are listed on a manifest, that a racer will have to go to; once at the checkpoint the racer will have his/her manifest updated. First racer to return with a completed manifest wins. Alleycats were first formalized in Toronto, Ontario, Canada in 1989; however, messengers have been racing against each other for much longer. Recently, with the boom in urban cycling, many non-messengers have been participating in and organizing alleycat races. From French, literally the "rear of the peloton" (main group of riders). Also called the Feu Rouge (red tail light) or Lanterne rouge. A bicycle modified for creative purposes while still being ridable. In the United Kingdom and a few other places: the same as randonneuring. In other parts of the world: a discipline related to randonneuring where everyone rides together in a group led by a captain, with a pre-defined schedule. A bicycle built for randonneuring and audax rides. Functionally in-between a road racing bike and a touring bike. Usually equipped with fenders, dynamo-based lights and a small front or rear luggage rack. A group of riders in a stage race (typically non-climbers and suffering domestiques) who ride together as a group on the mountain stages with the sole intention of finishing within the stage's time limit to allow them to start the next day. Also known by the Italian term gruppetto. French term for a technique used by raceofficials to impede the progress of team cars at times when they would affect the outcome of the race, specifically when they would allow dropped riders to regain a group they were dropped from. A shift lever mounted as a bar-end plug. Used with drop bars on road bikes, and on various under- and over-seat bars on recumbent bicycles or tricycles. French term for adventurer. See Breakaway specialist. A season-long time trial competition held in the UK. Designates the part of the tire that clinches to the wheel's rim. A bike throw occurs in the final moments of a bike race, usually within the last few feet. A sprint is involved, and at the end of the sprint, the rider pushes his arms forward, stretches his back out, and attempts to move his bike as far forward as possible, getting to the finish line before his competitors. 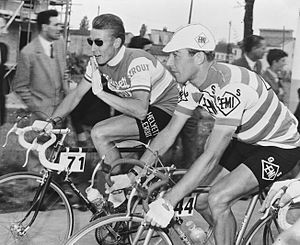 Riders of one team who set a relatively slow tempo at the front of a group to control the speed, often to the advantage of one of their teammates who may be in a break. A rider who has gone into oxygen debt and loses the ability to maintain pace is said to have blown up, variations include popping, exploding and detonating. This is a more temporary condition than cracking or hitting the wall. Fabric shoe covers worn by cyclists to protect their feet from rain. The bearing assembly which allows the crank to rotate relative to the frame. May or may not include the spindle which connects the two arms, depending on the standard to which it was designed. Breakaway, or break in short, is when a small group of riders or an individual have successfully opened a gap ahead of the peloton. a rider who is specialized in attacking the race from the start in order to show off his sponsor and to try his luck in winning the stage without having to fight with the whole peloton at the finish line. (randonneuring) The card or booklet used for collecting stamps that certify that you have visited the controls on a brevet ride. A rider who is a slow climber but an efficient descender. When a lone rider or smaller group of riders closes the space between them and the rider or group in front of them. This term often refers to when riders catch up with the main pack (or peloton) of riders or those who are leading the race. A support vehicle following a group of cyclists in a race, tour or recreational ride that may carry equipment, food, rider luggage, or mechanics. May also pick up riders unable to continue. Also called a SAG wagon. The riders arrive near the finish in massive numbers to contest the victory and attempt to draft their sprinters in a good position to claim the victory. Speeds higher than 60 km/h are to be expected. To cause one's bicycle to become airborne by lifting the front wheel and then the rear wheel into the air with such timing that both wheels are simultaneously airborne for a period. Bunny hops are performed either to navigate course features, to perform tricks or to avoid obstacles, depending on the discipline of competition. The rate at which a cyclist pedals (in revolutions per minute). The rider on a tandem bike steering the bike. Also pilot. The team cars following behind the peloton in support of their racers. Also designates the publicity cars that precede. The rear cog cluster on a derailleur bicycle, that fits on a freehub. It consists only of cogs, with no ratcheting mechanism, as the ratcheting mechanism is in the freehub. A group of cyclists cycling in a close knit formation akin to a road race, normally for the purposes of training. Annoying slapping of the bike's chain against the chainstays while riding over rough terrain. The tendency of a chain to stick to chain rings and be sucked up into the bike instead of coming off the chainring. Primarily caused by worn chainrings and rust on small chain rings, under high loads, and in dirty conditions. The front part of the drivetrain where the chain engages. May be composed of one to three gears. One of the two frame tubes that run horizontally from the bottom bracket shell back to the rear dropouts. A group of one or more riders who are ahead of the peloton trying to join the race or stage leader(s). There may be none, one, or many chases at any given point in a race. French term for 'hunting potatoes'. When a rider is wedged between the breakaway and the peloton, pedalling furiously but making little headway to catch the group ahead, he is en chasse patate. The stage of the 1910 Tour de France in the Pyrenees that included the cols: Peyresourde, Aspin, Tourmalet and Aubisque, was named the "Circle of Death". Now the hardest mountain stage in the Tour takes on this name. A one-day race of great prestige. Some classics date back to the 19th century. A rider who specializes in riding uphill quickly, usually due to having a high power-to-weight ratio. Pedals with a locking mechanism for cleats. A type of tire that uses a bead around the edge of the tire to attach to the rim of the wheel when inflated. The inner tube is separate. A race judge, in road-racing they are usually based in a car following the event. An attack that is made when a break has been caught by chasers or the peloton. Literally "Jackal Trick", also known as "Cancellara's Trick". Surprise attack in the two last kilometers to detach from the peloton and, finally, win the race. When a cyclist runs out of strength or energy, they are said to have cracked. Compare with hit the wall. A crank. One of the two arms of a crankset. Each arm connects a pedal to the bottom bracket. The bicycle drivetrain assembly that converts the rider's reciprocating pedaling action to rotating motion. It consists of two cranks (or arms), one or more chainwheels (or chainrings), plus the stack bolts that connect them. Sometimes the bottom bracket is included. A race on a closed short distance course with multiple laps. Often but not always a 4-cornered course; often includes primes (short for premiums and rhymes with 'seems') which are points or prizes for intermediate laps. Course length varies from 800 meters to 5 kilometers. A form of bicycle racing that consists of many laps of a short course featuring pavement, wooded trails, grass, steep hills and obstacles requiring the rider to quickly dismount, carry the bike past some obstacles and remount. (French: danser - to dance) - riding out of the saddle, standing up, usually in a taller gear than normal, and rocking side to side for leverage. The phrase dancing on the pedals is related. A device used to change gears, activated by shifters. Colloquial name for an Elimination race, an endurance track event where the last rider across the finish line is eliminated every two laps (from the phrase "the Devil takes the hindmost"). A rider who has an even energy output, without any bursts of speed, is said to be a diesel or diesel engine. A rider whose job is to support and work for other riders in their team (literally "servant" in French). Today the term has lost its bad connotation and serves as an acknowledgement of the true nature of racing tactics. See also water carrier. A term used when a rider collides with the open door of a parked car while cycling. To ride closely behind another rider to make maximum use of their slipstream, reducing wind resistance and effort required to ride at the same speed. (or drop-off) - A steep section, or sudden drop on a mountain bike trail. (or "Drops") - The lower part of the handlebars on a road bike; they run parallel with the top-tube. The slot, of various sizes and orientations, in the frame that the axles of the wheels attach to. (French) - A line of riders seeking maximum drafting in a crosswind, resulting in a diagonal line across the road. (Short for "end-over-end") - A crash where the back wheel is lifted off the ground and the bike flips over its front wheel. It is also a trick in which you keep your bike up on its front wheel. A mountain bike race where riders are timed on stages that are primarily downhill, with neutral "transfer" stages in between. The transfer stages usually must be completed within a time-limit, but are not part of the accumulated time. Also see funduro. (French: hope) Age class for riders 19 to 22. Also called U23. A stage of a stage race. The fall line describes the direction on a mountain or hill which is most directly downhill. A trail is said to follow the "fall line" if it generally descends in the most downward direction, rather than traversing in a sideways direction. A low-gradient climb, usually occurring partway up a steeper climb. So-called because while it may look deceptively flat and easy (especially after the steep climb preceding it), it is still a climb. A rider who has superior sprinting speed over the last few hundred meters of a race. In road bicycle racing, a location along the course of a long race where team personnel hand musettes containing food and beverages to passing riders. In mountain bicycle racing, a limited section of the course in which riders may accept food from non-racing assistants. Sometimes this is combined with the technical assistance zone if one exists. A group of riders, also known as a peloton. Slang for a fixed-gear bicycle. A red flag displayed with one kilometer remaining from the finish line of a race. Usually suspended over the road. The ability to follow a wheel is the ability to match the pace of riders who are setting the tempo. Following is easier than pulling or setting the tempo and the term can be used in a derogatory manner, e.g. "S/he only ever followed". Part of the frameset that holds the front wheel. Can be equipped with a suspension on mountain bikes. The bicycle frame plus the front fork. Disparaging term for any cyclist who "is marching to the beat of a different drummer", or a novice cyclist. An informal Enduro, ridden more for fun, or sometimes as training for a real Enduro. Alternatively wanton and furious cycling or furious riding; a minor statutory offence in England and Wales and Northern Ireland applied to cyclists who cycle over the national speed limit. A distance between two or more riders large enough for drafting to no longer be effective. Also used as verb (US English), for example: "Contador has gapped Armstrong!". It's much easier for a stronger rider to pull ahead of others once a gap has been achieved; without a gap, the others can draft along using significantly less power to sustain the same speed as the rider in front. While gaps are usually achieved through attacks, on mountain climbs, where slower speeds means the advantage of drafting is much less significant, riders are often gapped who simply cannot maintain the tempo of the faster riders. A jump with separate take-off and landing zones, i.e. has a "gap" between the ramps. Abbr. : general classification. the timing splits used to determine who is winning in a stage race. calculated from the first rider over the line each day time is then measured back by gaps from the winner of the day. Time gaps are then calculated back between riders and added to the overall position of riders relative to each other. Riders can attack in stage races for time rather than winning the days stage. They are said to be "riding for G.C.". In such circumstances alliances can form where some riders in a breakaway will work to help others win the days stage despite not contesting the finish as the overall gap the breakaway gains helps them "on G.C." The lowest gear ratio on a multi-speed derailleur bicycle; smallest chainring in front and the largest at the back. The smallest chainring on a crank with triple chainrings. A type of racing bicycle similar to one used in cyclo-cross but geared towards gravel roads common in the United States and Europe. A set of parts usually from a single manufacturer, usually consisting of, at least, bottom bracket, brakes, derailleurs, hubs and shifters, and may also include headset, pedals, and seatpost. A kit is a group, plus everything else a frameset needs to make a complete bicycle. In an echelon, where the size of a draft is limited by the width of the road, to be left with no good position to join the group and be sheltered from the crosswind. A rider that rides half a wheel in front of another on training rides and group rides. No matter how much the pursuer speeds up to keep up with him/her, s/he stays that distance ahead. Usually these people are frowned upon and less desirable to ride with. A style of road racing in Australasia where riders are given different start times, calculated based on their previous performance, so that slower riders have a chance of winning. A bicycle that does not have a rear suspension system. The bearing system in the head tube within which the handlebars rotate. A short wheel base recumbent bicycle with two large wheels, usually between 559 and 622 mm in size. The kind of recumbent most similar to normal road bikes in characteristics. A short distance uphill race, usually an individual time trial over approx. 3–5 km. See Hillclimbing (cycling). To completely run out of energy on a long ride, also known as "bonking". The French term primarily used in cycle races (most notably, the Tour de France) to designate a climb that is "beyond categorization", an incredibly tough climb. Most climbs are designated from Category 1 (hardest) to Category 4 (easiest), based on both steepness and length. A climb that is harder than Category 1 is designated as hors catégorie. French for "out of time", when a rider has finished outside the time limit in a race and is eliminated. Also shortened to "the knock". See hit the wall. A bicycle that is a compromise between a road bike and a mountain bike. Often chosen by cyclists for its comfort. To keep a race or a tour active there may be points along the course where the riders will sprint for time bonuses or other prizes. :52 Also known as the "Traguardo Volante" (TV) in Italian. A class of independent rider in the Tour de France. Also called a Touriste-Routier or Individuel. To aggressively increase speed without warning, hopefully creating a substantial advantage over your opponents. Also (more usually) denoting an attempt to bridge a gap from the peloton or gruppetto to a breakaway. For example: "he is trying to jump across". The keirin is a 2000-meter track event where the riders start the race in a group behind a motorised derny. The derny paces the riders for 1400 meters and then pulls off the track, at which time the cyclists begin a sprint to the finish line. Keirin racing has traditionally been practised in Japan, where it has been a professional sport for over 20 years, and only in which pari-mutuel betting on the riders is permitted. The title given to the best climber in a cycling road race. Also known as Gran Premio della Montagna (GPM) in Italian cycling. On the ride-tracking web site Strava, usually abbreviated as KOM: The fastest rider on any segment whether uphill, downhill or flat. A group, plus everything else a frameset needs to make a complete bicycle. Is said of a rider who climbs very well but is a poor descender. Referred to as "the knock". Short for "hunger knock". See hit the wall. French for "released", see drop. French for "red lantern", as found at the end of a railway train, and the name given to the rider placed last in a race. Sprinting technique often used by the lead out man where the rider will accelerate to maximum speed close to the sprint point with a teammate, the sprinter, drafting behind, hoping to create space between the sprinter and the pack. When the lead out man is exhausted he will move to the side to allow his teammate to race in the sprint. Often a line of lead out men will be used to form a lead out train to drive the speed higher and higher (and to reduce the chances of other riders attacking) over the closing stages of a race. The purpose of a lead out is for the sprinter to achieve high speed at the sprint approach using as little of his own energy as possible, so he has as much energy as possible for the final sprint. A rider who drafts behind others to reduce his effort, but does not reciprocate. Also wheelsucking. A TTF (technical trail feature) which consists of a pile of logs designed to be ridden over as a "challenge" or "test" of a rider's skill. 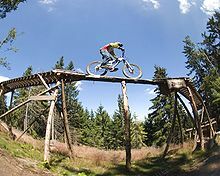 A TTF (technical trail feature) which consists of a log designed to be ridden over along its length as a "challenge" or "test" of a rider's skill. (Australian) First riders to depart in a handicap race. A short wheel base recumbent bicycle made to be as low to the ground as possible, for less wind resistance. Long wheel base, a recumbent bicycle geometry where the crank is behind the front wheel. Used to be common in the USA. a mass-start track event comprising teams of two riders per team. It is similar to a team points race, as points are awarded to the top finishers at the intermediate sprints and for the finishing sprint. Only one of the two team riders is racing on the track at any one time, riding for a number of laps, and then exchanging with his partner by a hand sling. The name comes from the original Madison Square Garden, which was constructed as a velodrome. The situation where a mechanic in a support vehicle will appear to be making adjustments to the bike but in reality they are giving fatigued riders a break by holding onto the car and getting a massive push-off when the commissaires get too close. Lifting the front wheel off the ground by the shifting of the rider's weight. The cyclist starting in a time trial either a minute ahead or behind another rider. Following a motor vehicle close enough to take advantage of their slip stream. Mountain biking, or a mountain bike. Small lightweight cotton shoulder bag, containing food and drink given to riders in a feed zone during a cycle race. The bag is designed so that it can be easily grabbed by a moving rider. The shoulder strap is placed over the head and one shoulder, the contents are then removed and placed into jersey pockets or bottles (bidons) are placed into bottle cages. The bag is then discarded. Dutch for wall. A short, steep climb. Originates from the Tour of Flanders locations such as Muur van Geraardsbergen and Koppenberg. To win a race solo, without any competitors in view. The "victory pose" shows only the winner. lifting the rear wheel of the bike using the front brake and shifting the rider's weight forward. A stoppie in motorcycling. Getting dropped from the group/peloton. A rider who is riding at maximum speed. When riding at maximum power output, a road racer often perches on the front tip of the saddle (seat), where the shell of an old-style leather saddle would be attached to the saddle frame with a rivet. The condition of being very close to the rear wheel of the rider ahead of you. Used to inform the rider that you have positioned yourself in their slipstream for optimum drafting. For example: "I'm on your wheel". Over seat steering, a steering configuration on recumbent bicycles where the handlebar goes over the seat. Unexpected and sudden dismount, either caused by braking too hard with the front wheel or by a road hazard. Group of riders riding at high speed by drafting one another. Riders will take turns at the front to break the wind, then rotate to the back of the line to rest in the draft. Larger group rides will often form double pacelines with two columns of riders. Sometimes referred to as "bit and bit". A list of races a rider has won. (French, meaning list of achievements or list of winners). Style and/or courage, displayed for example by breaking away, taking pulls at the front of the group, remounting after a crash or riding while suffering injuries. Example: "This rider insisted on continuing the race after the crash. After he crossed the line 100 kilometers later, doctors found out that he had 3 cracked vertebrae and 2 broken ribs." A basket, bag, box, or similar container, carried in pairs attached to the frame, handle bars, or on racks attached above the wheels of a bicycle. Panniers are used by commuters and touring cyclists in the same way hikers and campers use backpacks, as a means to pack and carry gear, clothing and other supplies and items. The term derives from the Old French, from Classical Latin, word for bread basket. Riding with considerable fatigue such that the rider is unable to maintain an efficient pedaling form that is strong and smooth. (from French, literally meaning little ball or platoon and also related to the English word pellet) is the large main group in a road bicycle race. May also be called the field, bunch, or pack. Riders in a group save energy by riding close (drafting or slipstreaming) near and, particularly behind, other riders. The reduction in drag is dramatic; in the middle of a well-developed group it can be as much as 40%. (UK) A form of theft that specialises in stealing parts from parked and locked bicycles to the eventual point that very little is left of the bike. Lifting the front wheel of the bicycle in the air and jumping up and down on the rear wheel while in a stationary position. From French, literally "pursuer" - refers to a cyclist or group of cyclists who are separated from and behind the leader(s) (tête de la course) but in front of the main group (peloton). This usually occurs when a small number of riders attempt to catch up to the leaders, either to join with them or to "bring them back to the pack" by encouraging the main group to chase them down. Primes (pronounced preems, after the French word for "gift") are intermediate sprints within a race, usually offering a prize or points. Primes are a way to encourage more competitive riding, and also an opportunity for companies to gain publicity by sponsoring a prime. In a criterium, a bell is sounded on the lap preceding the prime sprint at the appropriate line for that prime sprint. The line used for prime sprints need not be the same as the start or finish line. Primes may be either predetermined for certain laps or spontaneously designated under the supervision of the Chief Referee. Lapped riders are not eligible for primes except in the following situation: when a breakaway has lapped the main field, riders in the main field and the breakaway riders are then both eligible for primes. An individual time trial of usually less than 8 km (5 mi) before a stage race, used to determine which rider wears the leader's jersey on the first stage. To take the lead on a paceline or echelon. A track consisting of rollers and banked turns designed to be ridden completely by "pumping" - creating momentum by up and down body movements, and so pedaling is not required. A type of road bicycle racer that specializes in rolling terrain with short but steep climbs. Ideal races for this type of rider are the one-day classics in spring. These races are characterized by hills that are a 10-20% grade and 1–2 km long, examples include the Liège–Bastogne–Liège, the Mur de Huy in the Flèche Wallonne and the Manayunk Wall in the Philadelphia International Championship. The physique of this type of rider allows them to escape from the peloton through quick bursts usually with the assistance of a teammate. Examples of such racers include Philippe Gilbert, Paolo Bettini, Danilo Di Luca and Peter Sagan, who are able to sprint their way up the shorter climbs to win a stage or a single-day race. The stage of a multi-day road race which is deemed the hardest, most demanding and most prestigious stage of the race. The title given to the best climber in a cycling road race. The fastest female rider on a segment (such as on the ride-tracking web site Strava). The distance between pedal attachment points on a crankset. Affects ergonomics in how wide apart a riders feet will be. A ride in the randonneuring discipline of cycling, usually 200–600 km long. Also known as a brevet. A long-distance discipline of cycling where riders attempt courses from 200 to over 1200 km, collecting stamps at controls with the clock running constantly. Every participant finishing within minimum and maximum time limits is considered winner regardless of finishing order. Rides may ride in a group or solo as they please, and are expected to be self-sufficient between controls. Randonneuring is not regulated by UCI. A bicycle or tricycle where the rider is placed in a laid-back position, feet first and sitting in a seat instead of on a saddle. Usually used for ergonomics or aerodynamics. All world land speed records are held by (enclosed) recumbent bicycles, but they are not allowed in races governed by the UCI. An experienced rider who organizes a team's riders in a road race, including making tactical decisions and improvising new tactics when pre-race plans are overtaken by events on the road. They are the key link between the directeur sportif and the rest of the team. Road captains are normally selected on a race-by-race basis depending on the demands of the event and their relationship with the team leader. Notable road captains in recent years include Bernhard Eisel, Luca Paolini, Mick Rogers and David Millar. A race on pavement. Longer in distance than criteriums. Severe skin abrasions caused from sliding on the asphalt in a crash. A section found on some mountain biking trails with numerous rocks, designed to challenge a mountain biker's ability to ride over it skillfully. Mass that is rotating while the bike is moving, which is a form of inertia. A bicycle wheel can be approximated as a hollow cylinder with most of its mass near the rim. The rotation of the cranks, hubs, and other parts are less significant because both their radius and rotational speed are smaller. Reducing the rotating weight with lighter wheels and tires will permit faster acceleration and braking (or the same acceleration and braking with less energy). A rider who is strong on flat and undulating roads. The rider is well suited for races such as Paris–Roubaix and the Tour of Flanders. Tom Boonen and Fabian Cancellara are examples of this. How much a bike sinks into its travel just by having body weight on it. A broom wagon. Probably from the word "sag", i.e. droop, but sometimes explained as an acronym for "support and gear" or "support and grub". A command center where bicycles are maintained between races in preparation for the next race, a service course car is a car (such as those famously provided by Mavic) that carry spare bicycles or wheels in a race should the competing cyclist require it. A component used by the rider to control the gearing mechanisms and select the desired gear ratio. It is usually connected to the derailleur by a mechanical actuation cable. Electronic shifting systems also exist. Australian English for tubular tyres. A mountain bike trail designed for a single line of riders. To ride behind another rider without taking a turn on the front (thus tiring the lead rider), often in preparation for an attack or sprint finish. "Sitting in the wheels" is to take an easy ride drafted by the peloton or gruppetto. Often a strategic decision to save energy in races. A narrow beam to be ridden over lengthwise, as a "challenge" or "test" of a rider's skill. A skinny can be of various widths (almost as narrow as a bike tire, and up to 20 cm wide) and various lengths (from one to several meters). Some may also "neck-down" to successively thinner widths, and may also have steps, and be on an incline (up or down). They may be close to the ground, or in some cases dangerously high, and even span small creeks or other obstacles. French for "healer". A non-riding member of a team whose role is to provide support for the riders, possibly including transportation and organization of supplies, preparation of the team's food, post-ride massages and personal encouragement. Also known as comfort or endurance bicycle. A type of racing bicycle intended for less competitive cyclosportive and long distance riding with comfortable (more upright) riding geometry in comparison to dedicated racing bikes in addition to longer wheelbase, higher handlebar position as well as in recent years, disk brakes. Rider with the ability to generate very high power over short periods (a few seconds to a minute) allowing for great finishing speeds, but usually unable to sustain sufficiently high power over long periods to be a good time triallist, and is usually too big to have a high enough power-to-weight ratio to be a good climber. A cyclist who has a tendency to swerve unexpectedly and maintain inconsistent speed. Considered dangerous to follow at close range for the purpose of drafting. One part of a multi-day race, such as the Tour de France. An amateur rider, who is taken in by a professional team during the season. This lets the rider get some experience at riding a few pro races, and the team gets a chance to assess the abilities of the rider. Colloquial name for a bicycle. The part of the fork that is inserted into the head tube of the frame, and is used to attach the fork to the frame using a headset. The component that attaches the handlebars to the steer tube of the bicycle. They come in two major types, quill and threadless. The angle and length plays a major part in how the bicycle fits the rider. A call made by an overtaking cyclist to a cyclist ahead to warn them to "stick" to their line and not make any sudden turns. A technique often used by the rider who takes food and water from the team car during a race. The rider holds on for a variable amount of time to the bottle handed to him by the car occupant, who maintains his grasp on the object, effectively dragging the athlete. This concerted act gives the cyclist a moment to relax. Usually tolerated by the race commissaire if the bottle is held for 1-2 second, but may result in a sanction if an exaggeration is perceived. The rider on a tandem bike not steering. A race that ends at the top of a mountain climb. Such stages favour the climbers and are normally decisive in major stage races like the Giro d'Italia and the Tour de France. Taking both feet off the pedals and extending them outwards to resemble Superman in flight. A cyclist fending the air in front of a group of riders, then leaving the front after producing his or her effort by steering his or her bike to the side is said to "swing off". Example: "Ivan Basso swings off to let Peter Sagan go!" Short wheel base, a recumbent bicycle geometry where the crank is in front of the front wheel. Comes in many shapes, like highracers and lowracers. A bicycle built for two. Strictly only a bike where the riders are positioned in-line, otherwise it is a sociable. A group of cyclists working together as part of a competition. Riders start in groups or teams, usually of a fixed size. The time of the nth rider of a team counts for the classification for each team member. In the 2009 edition of Tour de France, riders who are dropped from their team's group would be scored with their own time, instead of the team time. A description of a trail or trail feature requiring "technical" skill to ride well. A technical climb, for example, may have an uneven surface and tight turns making the ascent challenging without well developed mountain biking skills. A designated section along the course of a mountain bike or cyclocross race along which riders are allowed to accept technical assistance (tools, spare parts, or mechanical work) from another person. In cyclocross racing the technical assistance zone is called the "pit". Not all mountain bike races contain a technical assistance zone, instead requiring riders to carry whatever tools and spare parts they may need. A rider accepting technical assistance outside of the designated zone risks disqualification. 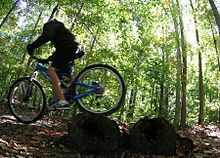 Technical Trail Feature, a feature often found on mountain biking trails designed as a challenge or test of a rider's skill. It can include log piles, log rides, wall rides, jumps, skinnies, and so forth. Difficult TTFs may have an optional bypass. Steady pace at the front of a group of riders. A relatively fast tempo can be used by a group or team to control the peloton, often to make up time to a break. The group will ride at the head of the bunch and set a fast enough pace to stretch the peloton out (also known as stringing out) and discourage other riders from attacking. Setting a slower tempo can be done for the purpose of blocking. A tempo is also a type of track race where two points are awarded to the first person to cross the line each lap, and one point is awarded to the second person to cross the line each lap. A level of exertion just below the rider's anaerobic threshold. Used as a reference point in training, this is the highest level of exertion that a given rider can sustain. From French, literally "head of the race" - the leading cyclist or group of cyclists, when separated from (in front of) the peloton. A rider that sits at the back of a breakaway but doesn't take a pull. Thus the rider gets a free ride similar to a ticket collector on a train who rides for free. The word commonly refers to fans along the roadside at professional road cycling races in Italy such as Tirreno–Adriatico, Milan–San Remo, the Giro d'Italia, and the Giro di Lombardia. A race against the clock where riders are started separately (ranging from 30 seconds to 5 minutes apart). The winner of the race is determined by the fastest person across the course. No drafting may be employed in a time trial as it is a solo race event. A rider that can generate relatively high power over long periods of time (5 minutes to an hour or more) in a race against the clock. To finish off a group of riders who are about to crack. The perpetrator knows (or guesses) he has better overall energy than his competitors, presumably after making them suffer with numerous accelerations. The ensuing violent acceleration is referred to as "sticking the knife in" while a number of riders, if not all, are dropped. An oval cycling track for races, banked at up to 50 degrees. Cycling tracks are usually, but not always indoors. Bicycling or cycle tracks are also called velodromes. An Olympic track is generally 250m long. A generous individual or group of individuals that provides acts of kindness to people on long hiking, biking, or mountain biking trails. a method in stage races to get a sprinter to the front of a bunch sprint and launched. The sprinter's team riders will form a line, usually within 5k of the finish and take turns to build up speed - the last rider in the train will be protected (drafting) until a short distance from the finish. Perfected by HTC and Mark Cavendish. Like a bicycle but with three wheels. Comes in both upright and recumbent versions. Also known as old school sprinter. A rider who excels primarily in sprint finishes on flat to mildly uphill terrain. Often too heavy to compete in longer or steeper uphill courses. Tubular tyres have the inner tube permanently stitched inside the casing. They are held in place using glue or glue-tape, and are affixed to rims which lack the sidewalls characteristic of a hook-bead rim. Tubulars take very high pressure which reduces their rolling resistance, and can result in wheelsets that are lower in overall weight than comparable clincher wheels. They can also be ridden at lower pressures than clinchers without the risk of pinch flats, because of the shape of the rim. This makes them well-suited to cyclo-cross, especially in muddy conditions where low tire pressures are used. Also called sew-ups, tubies, or tub. A trainer that spins a fan assembly at the same time (for pedal resistance and air flow). See Bicycle trainer. A turn is a rider sharing the workload on a pace line "s/he took a turn" or "s/he is doing a lot of turns on the front". Missing turns can be expressed thus "s/he has missed a few turns now and has stopped working". In a breakaway the riders expect to share the work equally in "turns". A rider who doesn't take his or her turn is "sitting on the break". Alternatively known as a city bike, a bicycle that is designed to be ridden on the road sometimes utilizing components of a mountain bike and in most cases, hydraulic disc brakes; similar to a hybrid bicycle. Under seat steering, a steering configuration on recumbent bicycles where the handlebar goes under the seat, like on an office chair. A cycling track for races. See track. An enclosed recumbent tricycle, usually designed with aerodynamics in mind. Can be fully enclosed or with a head-out configuration. Race spectators who gather at a technical point of the course where a crash is more likely to occur. The edge of the course. See also: hit the wall. A banked turn which becomes vertical or nearly vertical (i.e. a "wall"). A skilled rider on a wall at high-speed will lean sharply, and in some cases will almost become horizontal while on the wall. A wall-ride can be integral with the trail (formed of dirt or rock), or be constructed of wood. Referred to in French as a 'Domestique' - Members of a team who chase down competitors and try to neutralize their efforts; they will often protect their team leader from the wind by surrounding him. When a leader has to get a repair or stop to answer nature his domestiques will stay with him and pace him back up to the peloton. Called "water carriers" because they go back to the team car to pick up water bottles for team members. In Italian the term is "gregario". A cyclist that is concerned about the weight of his or her bicycle or its components. Lifting the front wheel of the bicycle in the air - through force transmitted through the pedals - whilst riding and continuing to ride on only the back wheel. The rider maintains the wheelie by applying pedalstrokes and rear brake in order to balance the bicycle on only the rear wheel. A rider who sits on the rear wheel of others in a group or on another rider, enjoying the draft but not working. Also leech, leeching. A racing bicycle adapted for use in winter seasons. Typically these are less expensive and incorporate mudguards, which are rarely present on their modern summer counterparts. A crash. Can be used as a verb: "This rider wiped out pretty bad on the wet corner." An outside lane on a roadway that is wide enough to be safely shared side-by-side by a bicycle and motor vehicle. The road may be marked with partial lane markings to designate the portion of the lane to be used by bicycles. To work is to do "turns on the front", to aid a group of riders by sharing the workload of working against air resistance by "pulling on the front" of the group. Similar to pull. Often used expressively in combination with other expressions: e.g. "He hasn't done any work all day, he has just sat on the breakaway." Working is used in many contexts in the peloton and road racing. Worn by the rider who is leading in the general classification in the Tour de France; also referred to as the maillot jaune. ^ "How would an end to UCI 3:1 rule affect bike design? Experts have their say - Cycling Weekly". 2016-09-02. Retrieved 2016-09-03. ^ a b c "Lexicon of cycling terms". INRNG. WordPress. 19 March 2011. Retrieved 17 October 2012. ^ a b c d e f g h i j k l m n o p q r s t u v w x y z aa ab ac ad ae af ag ah ai aj ak al "Glossary of Biking Terms and Slang". BicycleSource. 2012 BicycleSource.com. Retrieved 17 October 2012. ^ "The fastest aero road bikes". road.cc. Retrieved 26 March 2016. ^ a b "Frequently Asked Questions". Audax UK. Retrieved 23 June 2016. ^ a b c d e f g h i j k l m n o Geert van Oosterhout (28 May 2003). "Dictionary of Roadie Slang". Cybernauts. Retrieved 17 October 2012. ^ "THE LANGUAGE OF THE PELOTON". velominati.com. Retrieved 12 August 2018. ^ "Bar-End Shifters for Touring". Adventure Cycling. Retrieved 23 June 2016. ^ "FAQ". Greenspeed Recumbent trikes. Retrieved 23 June 2016. ^ a b "P Is For Peloton: The A-Z Of Cycling". The Guardian. Retrieved 12 July 2017. ^ Fotheringham, William (2011). Cyclopedia: It's All about the Bike. Chicago Review Press. p. 32. ISBN 1-56976-948-6. Retrieved July 19, 2013. ^ a b c d e f g h i j k l m n o p q r s t Barry Boyce. "Glossary: List of cycling terms". CyclingRevealed. Retrieved 17 October 2012. ^ Elspeth Huyett (6 May 2015). "How to Outsprint the Competition with a Bike Throw". Bicycling. Rodale, Inc. Retrieved 28 May 2015. ^ a b c d e f g h i j k l m n o p q r s t u v w x y "Cycling Lingo: A List of Common Terminology". RoadBikeRider. 2001–2012 RBR Publishing Company. Retrieved 17 October 2012. ^ a b c d Jonathan Simmons (2 July 2010). "On Biking: some bike slang for beginners". Boston.com. 2012 NY Times Co. Archived from the original on 1 September 2017. ^ a b "Tandem Bicycles". Sheldon Brown. Retrieved 23 June 2016. ^ McGann & McGann 2006, pp. 277–288. ^ a b c d e "Tour de France: Time Trials, Mountains Stages, Prologues, and More". For Dummies. John Wiley & Sons. Retrieved 22 March 2013. ^ Gerald Churchill (22 May 2005). "Parra wins stage 13 of Giro, Savoldelli seizes maglia rosa after basso cracks". RoadCycling. Retrieved 17 October 2012. ^ Brown, Sheldon. "Crankset". Sheldon Brown's Bicycle Glossary Cn-z. Retrieved 2009-12-23. ^ "Six best cyclocross bikes 2017: a buyer's guide". 2 January 2018. ^ "The Door Prize: Bicyclists killed from motorists opening their doors". Bicyclesafe.com. Retrieved 2012-08-25. ^ a b https://www.singletracks.com Falkirk Funduro. ^ https://rootsrated.com Farlow Gap - Mountain Biking: fall line (2nd paragraph) — "The trail becomes loose and rocky, and becomes fall line into a wide open rock garden..."
^ Komodo Design Ltd. "Cycling and the law". Retrieved 26 March 2016. ^ a b c d e f g https://www.trailforks.com Technical Trail Features. ^ Brown, Sheldon. "Glossary". Retrieved 2009-12-23. ^ "Best gravel bikes for your adventures in 2018 - Cycling Weekly". 30 December 2017. ^ a b Brown, Sheldon. "Crank". Sheldon Brown's Bicycle Glossary G. Retrieved 2009-12-23. ^ "BBC - 606 - - A31805831 - A Sunday In Hell". Retrieved 26 March 2016. ^ a b c d e f "Recumbent Glossary". Recumbent Bike Riders. Retrieved 28 April 2017. ^ a b c d e f g "Cycling Glossary". CyclingiSport. 2012 iSport. Retrieved 17 October 2012. ^ "le Tour de France: cycling tactics". abelard.org. Retrieved 2012-06-06. ^ "Rise of the Mamils (middle-aged men in lycra)". BBC News. 14 August 2010. ^ "Middle Aged Men In Lycra". The Sydney Morning Herald. September 2, 2010. ^ Simon_MacMichael on August 16, 2010 - 08:37 (2010-08-16). "New research highlights rise of the MAMIL (that's middle-aged men in Lycra) | road.cc | Road cycling news, Bike reviews, Commuting, Leisure riding, Sportives and more". road.cc. Retrieved 2012-08-25. ^ Sibun, Jonathan (6 October 2010). "Wiggle thanks 'middle aged man in lycra' for record profits". The Daily Telegraph. London. ^ "Glossary of Cycling Terms". Century Cycles. Retrieved 11 March 2016. ^ "How to Ride in a Paceline, Drafting, Hand Signals and Other Biking How Tos". Tyler Cloward. Retrieved 2011-10-04. ^ 09/09/2010 (2011-05-14). 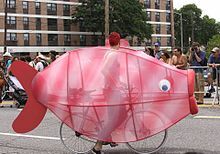 "How to prevent your bike from getting piranha'd". Londoncyclist.co.uk. Retrieved 2012-08-25. ^ https://www.youtube.com Leavenworth Pump Track. ^ "BikeRaceInfo's Cycling Glossary". BikeRaceInfo.com. Retrieved 13 July 2015. Queen Stage: The hardest, most demanding stage of a stage race and is always in the high mountains. ^ Cho, Dave (30 August 2012). "What it Takes to Triumph in Pro Cycling". WildRockPR.com. Wild Rock. Retrieved 13 July 2015. This was considered the “Queen Stage,” which means it was the toughest, most epic, and most prestigious stage of the race. ^ "Frequently Asked Questions about Recumbent Bicycles". Recumbent bicycle and Human Powered vehicle information center. Retrieved 23 June 2016. ^ https://www.youtube.com Ridgeline Trail (2:11 "rip"). ^ a b Doug Landauer and Jim Frost (20 August 1999). "The Dictionary of Mountain Bike Slang". Retrieved 17 October 2012. ^ Mahé, Louise (23 March 2015). "What type of Tour de France rider are you most like?". Cycling Weekly. Retrieved 25 March 2015. ^ John, Timothy (25 March 2015). "The role of the road captain in professional cycling". Rouleur. Retrieved 25 March 2015. ^ "How to set your sag". MBR. June 10, 2016. Retrieved 2018-07-17. ^ Daniel Benson. "Inside Sky Pro Cycling's service course in Belgium". BikeRadar. Retrieved 26 March 2016. ^ "Service with a smile: Mavic keeps 'em rolling - VeloNews.com". VeloNews.com. Retrieved 26 March 2016. ^ "Bikes to make riding comfortable - Buyer's guide: sportive and endurance bikes". Road Cycling UK. Retrieved 26 March 2016. ^ "Buyer's guide: 2016 sportive and endurance road bikes + 19 great choices". road.cc. Retrieved 26 March 2016. ^ "What are Headsets and why so many sizes?". BikeRoar. 2013-12-05. Retrieved 2016-09-22. ^ John Whitney (22 June 2012). "Who needs doping? Most creative Tour de France cheats". BikeRadar. Future Publishing Limited. Retrieved 15 October 2012. ^ "Fan's Guide to Tour de France Summit Finishes". Bicycling.com. Retrieved 9 April 2016. ^ http://riders.co How to Superman. ^ "Setting tempo". Wenzelcoaching.com. Retrieved 2012-08-25. ^ "Fitness: Time To Up The Tempo". BikeRadar. 2009-05-18. Retrieved 2012-08-25. ^ Peter Hymas (19 July 2012). "Valverde lays claim to final mountain stage, Wiggins, Froome stick the knife in". Cycling News. Future Publishing Limited. Retrieved 16 October 2012. ^ "A beginner's guide to interval training". BikeRoar. 2014-05-05. Retrieved 2016-09-22. ^ "What is a velomobile?". Velomobiel.nl. ^ James Huang. "FSA announces Super Light headset bearings". BikeRadar. Retrieved 26 March 2016. ^ "Winter Cycle Training". Harlechtri-entries.org.uk. Retrieved 2012-08-25. McGann, Bill; McGann, Carol (2006). The Story of the Tour De France, Volume 1: 1903–1964. Indianapolis, IN: Dog Ear Publishing. ISBN 978-1-59858-180-5. Retrieved 4 June 2015.